I keep shooting this building and the surrounding intersection because the architecture provides all kinds of graphical possibilities. Here, today, the drum in front of the tower looks almost like polished metal, whereas in reality, it’s coarse concrete. And a 25-second daylight exposure eliminates all but traces of traffic and the most immobile of pedestrians. 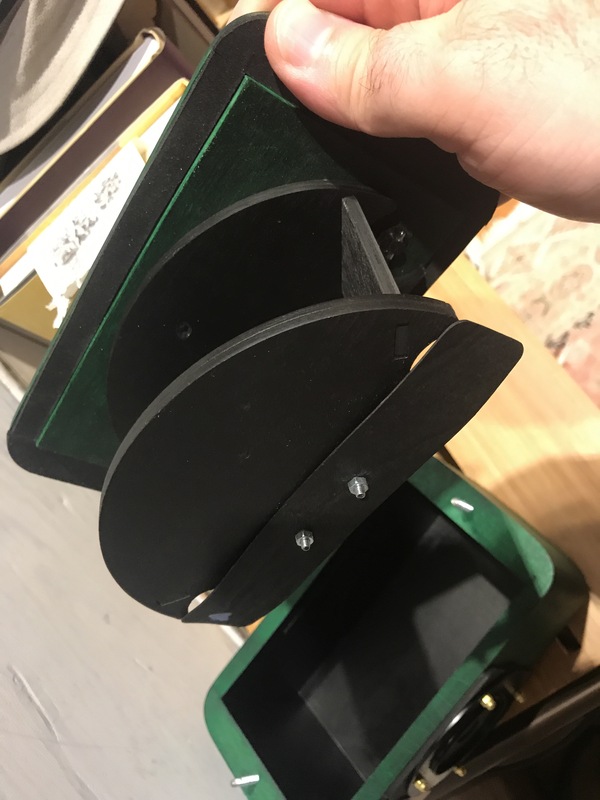 The 6×18 pinhole, when kept plumb, level and square, is virtually distortionless. I’m going to try shooting this scene again but from a low angle, pointing up, to see how curved it gets. Now, with working with the pinhole, Kodak Tri-X has really turned into my go-to film because I really need the extra speed even in daylight. And the grain of Tri-X, in 120, and in contact prints/scans, really is a non-issue. 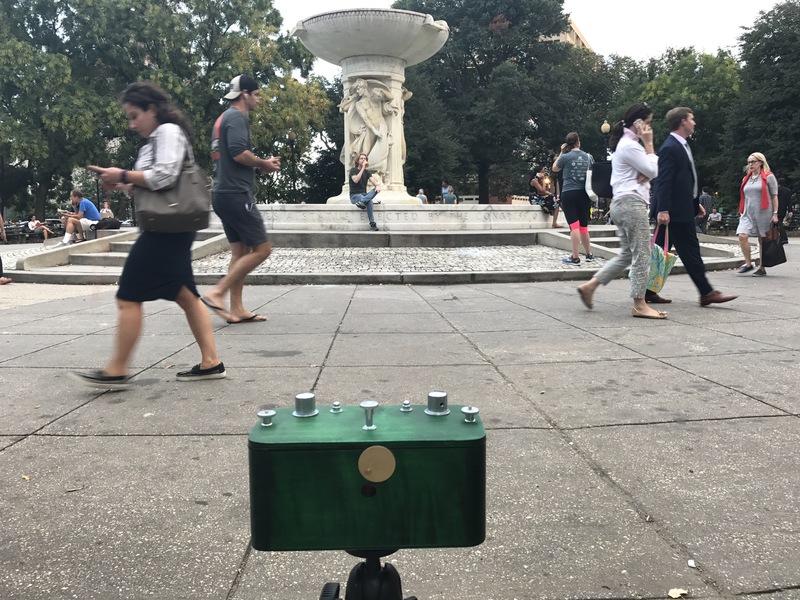 I’ve been out getting my exercise walking around Washington DC shooting 6×18 panoramic pinhole images. 6×18 is quite a large negative, and it’s not something easy to shoot because the composition is so wide. I think of this image as being sort-of an “un-pinhole” because it captures a scene briefly enough that at first glance, it appears the action is frozen. Look more carefully at the people in the scene, though, and you’ll see them blurred during the 25 second exposure. 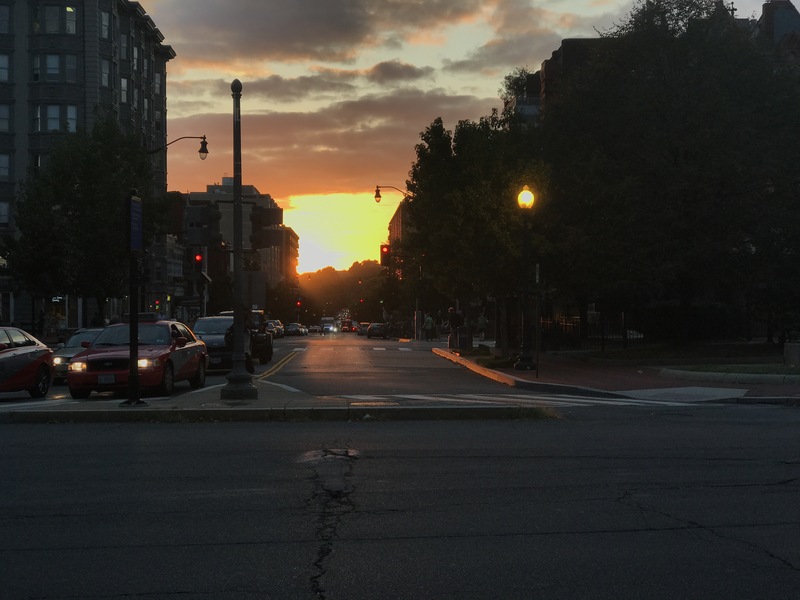 I also caught the sunset reflecting off the office building in the distant background. In a strange kind of way, it feels a little Crewdson-esque, like a not-quite-still from a motion picture. A different take on the “action pinhole” shot. 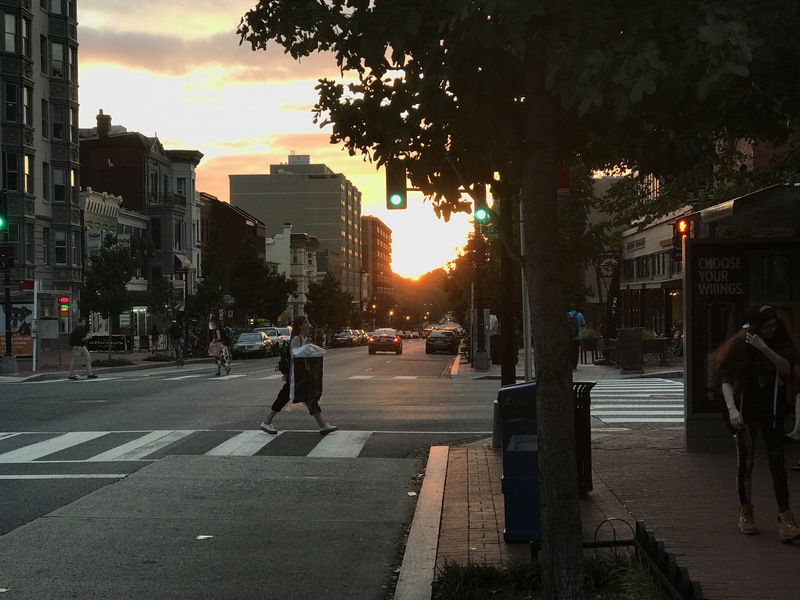 This is the plaza at Park Road and 14th Street, NW in Washington DC. It’s a very popular place for people of all ages to hang out, day or night. The sculptures at the back of the plaza are “light trees” that use solar panels to charge the lights built into the “branches”. Like the first image, there’s “action” happening here that’s been described in the span of 25 seconds or so, where some people are more static and perceptible than others. The pinhole distorts perspective here. The plaza is round, but like in the next image, the curvature of the pinhole’s focal plane exaggerates the circular aspect. Here I’m playing with intentional distortion through tilting the curved film plane of the pinhole camera. This is what you get when you point a curved film plane up, at something that is already curved to begin with. I’m really getting into these sunburst effect shots from having the sun in the frame with a small aperture pinhole. It gives a whole different take on the notion of “flare”. For comparison, I’ll include an earlier shot I did with the same effect. I’ll have results to show from this later this week. 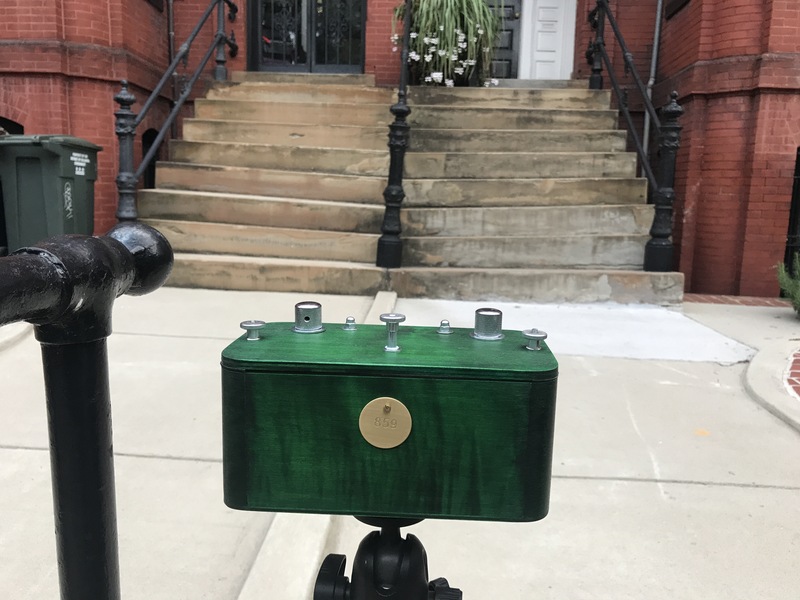 This camera has a hemispherical film plane, which does two things: it makes the entire negative area equidistant from the pinhole, so it doesn’t have vignetting or fall-off toward the edges, and it produces a particular form of curvilinear distortion. The camera has an f/300 pinhole, which is quite a small aperture, requiring 186 times more light than f/22. So even full daylight exposures are quite long- 1/2 second. To control exposure, there is a built-in shutter that slides to the left. It also comes with a 52mm filter adapter, useful for things like shooting infrared or special effects filters. The brand name on it is Vermeer, and the maker is in Poland. 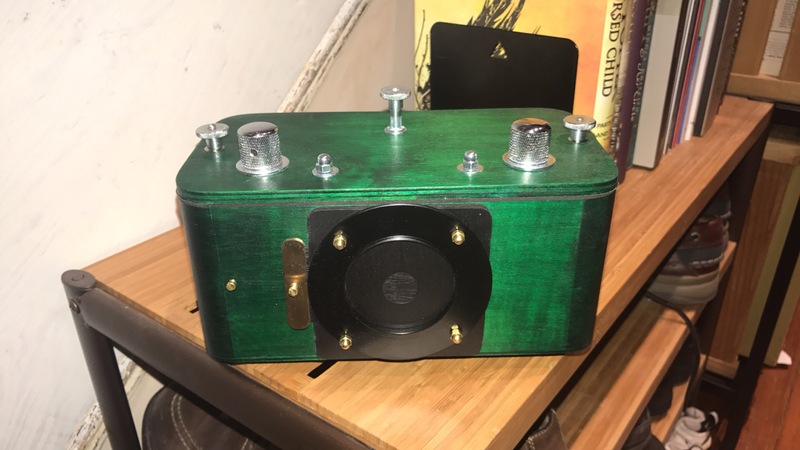 He has a shop on EBay for these, and makes them in a variety of sizes and configurations, including anamorphic cameras. My one item on the wish list for it would be either a cold shoe for mounting a bubble level, or just built-in levels on two axes. Do you want to improve your photographic vision, but find yourself frustrated with your images? The Primitive Eye is a six-week guided exercise in seeing. The course meets on Tuesdays from 7-9pm, September 12 to October 24th. The only requirements are that you are ready and willing to tackle some challenging assignments, and that you obtain a pinhole objective for your camera. 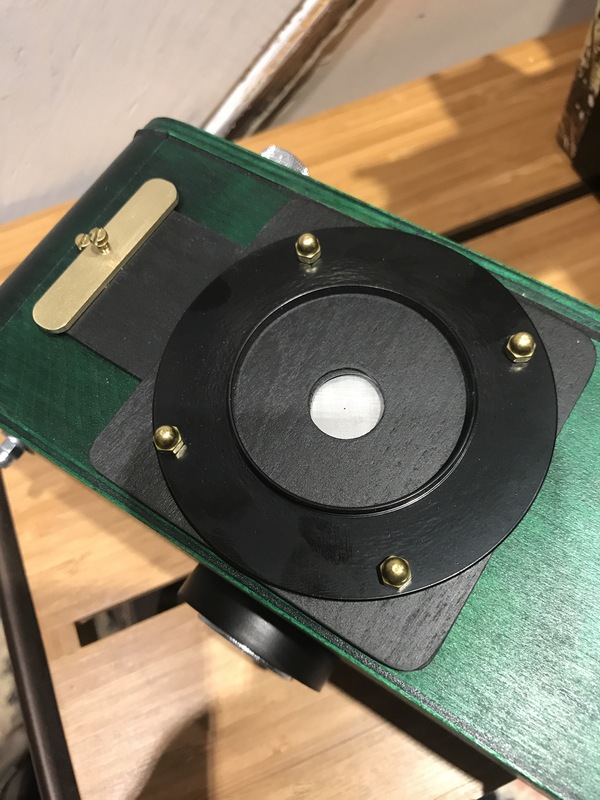 This could be a pinhole in a body cap, it could be a custom pinhole objective, or it could be a dedicated pinhole camera that shoots film or photographic paper. It could be a digital camera or it could be a Quaker Oats tube. By stripping down your gear to the most basic of photographic tools, the pinhole lens, you will be forced to contend with the three fundamental components of a photograph – light, composition, and time. Light: light itself, with directionality, quality, and quantity, must be critically accounted for in pinhole photography. There’s no gaming the system with a fast lens. Typically, pinhole objectives are wide-angle. Because they are so small, composing through the objective is difficult at best. You have to carefully plan your composition, or you have to open yourself up to serendipity. Either way, you have to know how your camera sees before you set it up, or you’ll have no control over what you get. Pinhole objectives force a recognition of the importance of time in a photo. With modern, automated cameras that have mechanical shutters that freeze slices of time as small as 1/8000th of a second, and electronic ones much faster, we are used to thinking of photographs as truly static objects, and movement and blur are objectionable. With pinhole photography where a 1 second exposure is quite fast, you must carefully plan for how movement will be captured by your camera, because it will. It will also force you to re-think the notion of a photograph as being time-less and two-dimensional, and being time-ful and four-dimensional.